The second significant Pacific storm of the season barreled into Southern California Wednesday, bringing with it strong winds that felled trees, heavy rains that inundated roads and freeways and downpours that prompted mud to flow into homes in Pasadena. The storm system, which was actually the third to hit the region in three days, is part of what forecasters call a “conveyor belt” of storms typical of an El Nino pattern of repeated rain events over a series of days — saturating hillsides and slowly elevating the risk of flooding and mudslides. 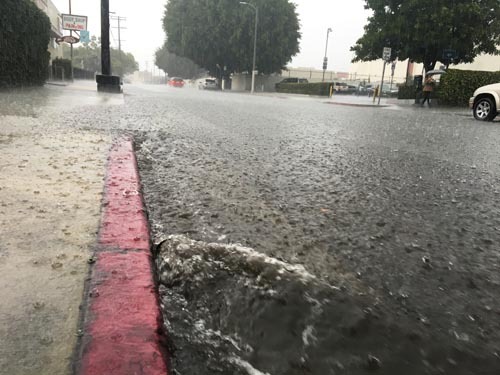 While rain fell sporadically much of the morning, major downpours were reported around midday, particularly soaking the Sun Valley area, where the northbound Golden State (5) Freeway flooded, forcing the closure of all but one lane as crews worked to clear drains. Traffic backed up for miles as motorists crawled through the flooded area. Street flooding has been a nightmare for motorists during both storm systems, hitting several local areas particularly hard Tuesday. 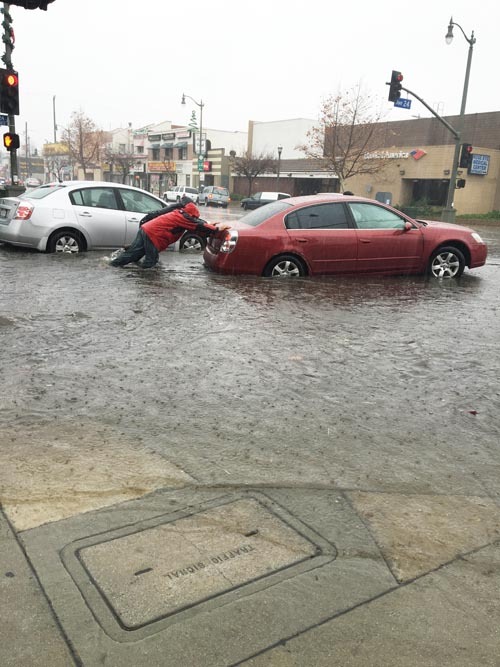 North Broadway in Lincoln Heights was just one of many streets in the region overwhelmed by intense rainfall from the second of four El Nino storms this week. Two men help push a stalled car out of the flooded intersection of North Broadway and Avenue 21. Heavy rain rushing down Avenue 24 flooded the intersection at North Broadway, causing at least one driver to call for help when she was forced to exit the vehicle when it stalled in the deluge and water pushed against the car’s doors. A group of good Samaritans pushed the car out of the roadway just minutes before police and fire units arrived on the scene. Just a few blocks away, firefighters had to rescue motorists in a car caught in the flooding on Avenue 26 at the low point below the Gold Line Bridge next to the Cypress Park/Lincoln Heights Station. It was a scene played out across the basin, with some areas even harder hit. By mid-morning, the Sepulveda Basin area began flooding, and a series of streets were blocked as water levels rose. One motorist driving a Mini Cooper found himself trapped when water rose up to the car’s doors. The man crawled out of the car and waded to safety without assistance from rescue crews. The flooding resulted in multiple street closures near the basin. Closures were still in place Wednesday. 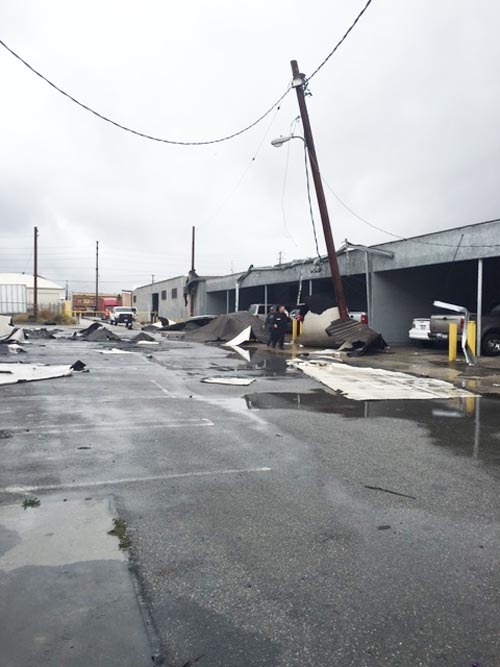 In Vernon, severe weather struck late Tuesday afternoon, ripping material off the roof of one building and shattering windows in several others near Loma Vista Avenue and 49th Street. National Weather Service Meteorologist Robbie Munroe said several reports were made about a weak tornado in the area. Vernon police said witnesses said a tornado caused the destruction. Meteorologists have since characterized the weather event as a “gustnado” or “downburst,” both of which can be the result of unusually strong wind. An El Niño storm-driven funnel-shaped cloud caused extensive damage to a number of Vernon businesses and parked vehicles. The damage to family-owned furniture manufacturer Arely’s Furniture was so severe it was red-tagged.